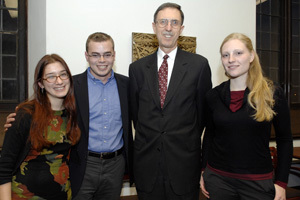 Students garner Rhodes, Marshall scholarships to study in the U.K.
Left to right, Alice Sverdlik, a 2008 Marshall scholar, Andrew Hammond, a 2008 Rhodes scholar, John Boyer, Dean of the College, and Nadine Levin, also a 2008 Rhodes scholar, gather to celebrate the students’ scholarships. Isra Bhatty, also a 2008 Rhodes scholar, was unable to the attend the reception in the Harper Memorial building. Editor’s Note: The story about the University’s Rhodes scholars and Marshall scholar that was published in Dec. 6, 2007 edition of The University of Chicago Chronicle was an incorrect version of the article. We have revised the story that appears here online for our readers. The Chronicle regrets this error. Prison reform, poverty law, public health and urban housing policies are some of the passions that led three Chicago alumni and one fourth-year student to receive Rhodes and Marshall scholarships this fall. Isra Bhatty, Andrew Hammond and Nadine Levin are among the 32 men and women named 2008 Rhodes scholars out of the 764 applicants. Rhodes scholarships provide two or three years of study at Oxford University, beginning in October 2008. Chicago and Stanford University led the country for the most Rhodes scholarships this year. Alice Sverdlik is one of 37 recipients of a 2008 Marshall Scholar, and she will also will head next October to the United Kingdom to attend the London School of Economics for two years. Hammond, who graduated in 2007 from the College with a concentration in Political Science, is going to miss baseball next year—but he is OK with that. Hammond noted that he is especially looking forward to the slower pace at which Oxford operates, as he works toward a graduate degree in Comparative Social Policy. Currently, Hammond is the Tom Joe Fellow at the Center for the Study of Social Policy in Washington, D.C., where he is able to explore reform of anti-poverty policy in the United States. Hammond said he does not have a specific career objective. While at Chicago, Hammond was an editor at the Chicago Maroon, director of the student chapter of the ACLU and a lover of the Chicago music and theater scene. He was a Student Marshal, a member of Phi Beta Kappa and received a Harry Truman scholarship in 2006. During his time in the College, he served on the campaign staff of Barack Obama’s 2004 Senate campaign and was a policy writer at the Sargent Shriver National Center for Poverty Law. In addition to the Rhodes scholarship, Hammond was offered a Marshall scholarship this year, which he will be declining in order to accept the Rhodes. In her fourth year in the College, Levin, whose concentrations are Biology with a minor in Spanish, already has experienced life abroad. She noted the seemingly endless battle Bolivians are fighting against tuberculosis and that regardless of how inexpensive medical care appears to be by Western standards, the Bolivian people struggle to pay for it. “Stepping foot in that hospital, I just saw so many problems that I never knew existed, so many crises that you would never see in the U.S.,” she said. As Levin pursues a graduate degree in Global Health Science & Medical Anthropology at Oxford University, she plans to take advantage of the University’s international research program so she can return to South America and continue understanding medical care in poverty-stricken areas and developing countries. “I hope that someday I will be able to pursue a career focused on international health care,” she said, adding that she would love to work for the World Health Organization. Levin’s other loves include violin, cooking and playing Ultimate Frisbee. At Chicago, Levin participates in the Chamber Music Program and is a member of the Women’s Ultimate Frisbee team. Levin is a Student Marshal, a member of Junior Phi Beta Kappa, and a recipient of a 2006 Barry M. Goldwater scholarship. For Bhatty, attending Oxford University is a dream come true in itself. “I was born in England and my father always really wanted me to go to Oxford,” said Bhatty, a 2006 graduate of the College with a concentration in Economics, who is now in her first year at Yale Law School. At Oxford, Bhatty will pursue a graduate degree in Evidence-based Social Intervention. “This program excites me greatly; I cannot wait to delve into this field,” said Bhatty, who has worked in Chicago’s south- and southwest-side communities with currently or formerly incarcerated individuals. She also participated in crafting the Illinois House Bill, the SMART Act, which passed in the Illinois State Senate last spring. The SMART Act, which stands for Substance Abuse Management Addressing Recidivism Through Treatment, proposes an alternative sentencing program for low-level, non-violent drug offenders. But in her spare time, it’s football that comes first for Bhatty. Her other accomplishments include being a Student Marshal, a member of Junior Phi Beta Kappa, founder of the Southside Tutoring Program, and working by phone as a translator for detainees at Guantanamo Bay detention camp through her work at the Center for Constitutional Rights. For Sverdlik, receiving a Marshall scholarship was a shock. A history concentrator, Sverdlik led the Amnesty International club for three years and received a human rights internship with an environmental organization in Paraguay. After graduating Phi Beta Kappa in 2006, she stayed in Chicago to work on housing rights at the Sargent Shriver National Center on Poverty Law. She also has translated at a free medical clinic in Dallas and volunteered with the Night Ministry on Chicago’s South Side. “In my future work on urban slums, I’m hoping to build upon my concerns for poverty, housing, the environment and health,” Sverdlik said. Sverdlik, who is currently working in Dallas, Texas, for a non-profit housing organization, will pursue two graduate degrees beginning next fall in Social Policy and in Urbanization and Development at the London School of Economics, where she hopes to get her Ph.D.
Before Sverdlik heads to London, she plans to spend six months volunteering in a slum housing organization in Nairobi, Kenya. Established in 1953 by the British Parliament, Marshall scholarships served as an attempt to celebrate the Marshall Plan, the United States’ effort to rebuild Europe after World War II. The scholarships provide two or three years of study in the United Kingdom. Unlike the Rhodes scholarships, Marshall scholarships allow recipients to attend any university in the U.K.
Rhodes scholarships were established in the will of British colonial pioneer and statesman Cecil J. Rhodes. The program was founded at the time of his death in 1902. Rhodes scholarships provide tuition and cover of living expenses for two or three years at Oxford University. Rhodes scholarships are the oldest international scholarships awarded to American students.